Before the 2016 Gwyn's High Alpine restaurant remodel, there was a framed photo of Cody Decker and Pete Platek hanging on a wall there. See below. Cody is on the left and Pete on the right in this photo. Both used to work at Gwyn's. Cody died on February 9, 2009 and Pete died on July 11, 2008. See the sections below the photos for obituaries and other materials. The item below appeared on the Absolutely Aspen Blog on July 12, 2008 (http://aspenabsolutely.blogspot.com/2008/07/fond-farewell-to-peter-platek.html). Quoted from the Aspen Times, July 12 edition: "Longtime local musician and chef Pete Platek of Aspen reportedly died Friday as a result of complications from an injury to his arm. The Mesa County Coroner’s Office confirmed Friday evening that Platek died at 2:05 p.m., although a spokesman said he did not have the cause of death available. Hospital administrator Scott Coleman said he, also, was not aware of the cause of death. 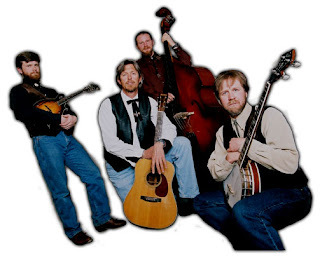 Platek played banjo and guitar and sang for the Lone Pine Bluegrass Band, as well as working as a chef in the area. He reportedly had been in the valley for approximately 15 to 20 years. He injured his arm Thursday, had it treated at Aspen Valley Hospital and was released, according to friends. But on Friday, Platek was back in the hospital for treatment of an unexplained problem. He was flown to St. Mary’s Hospital in Grand Junction for emergency care, where he died, friends said. Platek is survived by his wife, Diane, and a child." July 14 update: I understand from a friend of Pete's that he went to Aspen Valley Hospital because he thought he had somehow injured his arm. The arm was treated and he was released. He returned the following day, still in pain. It was ascertained that he had a staph infection. He was air-lifted to St. Mary’s in Grand Junction, where he passed away. His spirit and legacy will be carried on by his wife Diane; son Bryce; his mother Caroline; sister and brother-in-law Karen and Tom and their children Mike and Katie; and his brother and sister-in-law, Garrett and Laura. His friends in Aspen will hold his memory in their hearts. A memorial service will be held for Pete on Wednesday, July 16, at the concert meadow on Aspen Mountain. Free gondola rides to the service will be available from 10 a.m. until 10:30 a.m.
July 17 update: A member of the Mesa County coroner’s office confirmed on July 16 that necrotizing fasciitis, more commonly called the “flesh-eating bacteria,” is the cause of death listed on Pete’s death certificate. According to his widow Diane and accounts from friends, Pete was injured, but apparently not cut, while he was moving on July 10 from one apartment to another. He reportedly was taken to Aspen Valley Hospital when he began to experience considerable pain. After being examined and released with medications to treat inflammation and pain, Pete reportedly went home for a while but then was taken back to the hospital later in the day, complaining of ever-worsening pain. He was flown to St. Mary’s Hospital, where he died at 2:05 p.m. on July 11 while being treated in the intensive care unit. His Wednesday memorial service was attended by some 200 friends and mourners. A memorial fund in his name has been set up at Wells Fargo Bank in Aspen. Pete, we’ll all miss you.